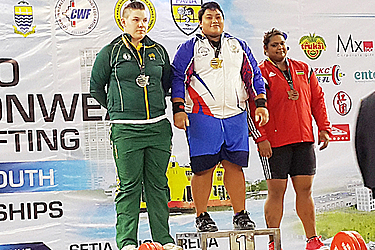 It’s Gold again for Samoa, as an elated president of the Samoa Weightlifting Federation, Tuaopepe Jerry Wallwork has reported from the Commonwealth Senior Weightlifting Championships in Malaysia. Despite fielding a small group of new, young lifters because of the cost factor, Tuaopepe was pleased with the results. Samoa’s Iuniarra Sipaia won the Gold medal in the female 75+kg division. The Silver went to Jade Fassina of Australia and the Bronze to Shalinee Valaydon of Mauritius. “This is the first time Sipaia has won Gold in a Commonwealth Championships,“ Tuaopepe said. “She was outstanding and produced a perfect performance with 6 out 6 attempts, all successful. However this Gold is not the first for the 23 year old from Moto’otua. In the past three years, she won a gold medal at the 2013 Pacific Mini Games and another at the 2016 Oceania Weightlifting Championships lifting a total of 246 kg. She also competed at the Commonwealth Games in Glasgow in 2014. And in a great effort, a 17 year old lifter has added to Samoa’s medal tally. Following in the Opeloge family tradition of talent and success in this sport, young Don Opeloge took out the Bronze medal with a personal best in the Men’s 85kg division. “Don is only 17 years old and also performed well,” said Tuaopepe.